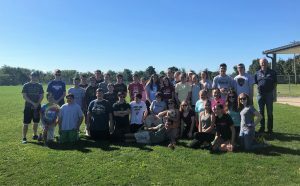 On Sunday over 35 McQuaid Jesuit and Our Lady of Mercy students gave up their morning to volunteer at Oatka Cemetery in Scottsville. The cemetery is a final resting place for people who were extremely poor or experienced homelessness and the gravestones are often neglected or covered by overgrown weeds. Organized by the Mothers for Others M&M Service, students helped weed around the graves and planted new flower bulbs. The students were featured on the evening news for their work.